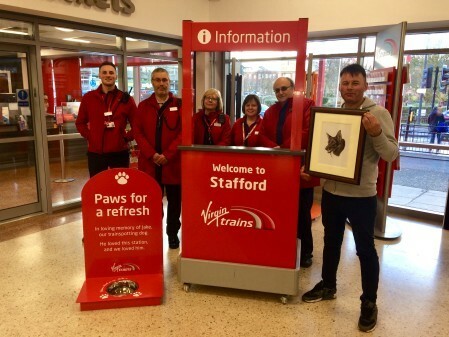 Virgin Trains has paid tribute to Jake, their trainspotting dog with the unveiling of a commissioned portrait and a new dog watering bowl at Stafford station. Over nine years, Jake had been a regular sight at Stafford train station and had become part of the Virgin Trains family; joining the station staff and delighting customers to welcome trains into the platform with lots of lively wags and barks. Such was his popularity, Jake helped launch the company’s new uniform in 2017. The envy of his canine friends, he was the proud owner of a bespoke dog-friendly uniform, carrying it off in in a way only Jake could. His untimely loss last year came as a shock to everyone. The dog watering bowl, which can be found in the main concourse, and a handy stop for those travelling with their canine companions, has the simplest of messages.